AN 86-lb. helicopter glider, believed to be the smallest aircraft in the world today, has been developed and flown by Bensen Aircraft Corporation of Raleigh, N. C, for use in engineering tests of lighter-than-man helicopters. 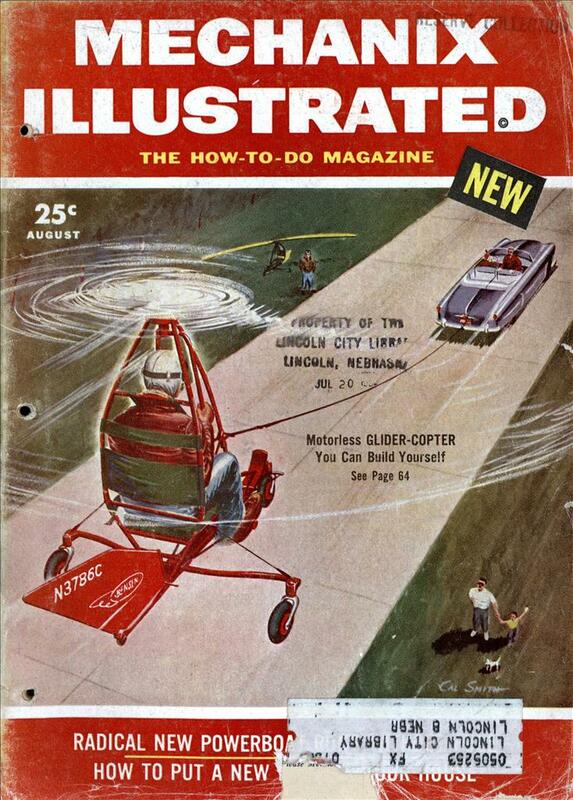 Like soaring gliders and sailplanes, the helicopter glider has no engine; it is towed by a car until it becomes airborne and will stay in the air as long as it is towed or as long as there is sufficient wind to keep its rotor blades turning. 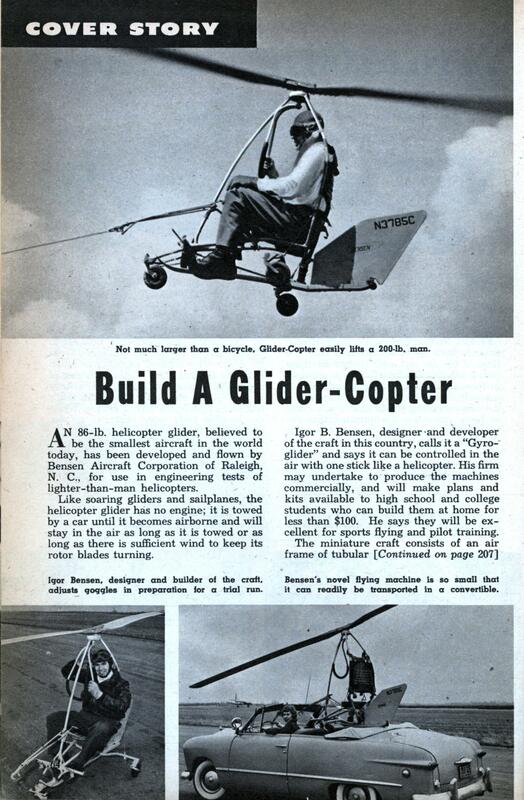 Igor B. Bensen, designer and developer of the craft in this country, calls it a “Gyro-glider” and says it can be controlled in the air with one stick like a helicopter. His firm may undertake to produce the machines commercially, and will make plans and kits available to high school and college students who can build them at home for less than $100. He says they will be excellent for sports flying and pilot training. The miniature craft consists of an air frame of tubular [Continued on page 207] steel from the Bensen “Mid-jet” helicopter, a control stick and two nine-ft. rotor blades. Extremely simple to fly, it cannot stall because it is impossible to stop the rotor blades from turning while it is in the air. The Gyro-glider takes off at a speed of 20 mph, lands at about seven mph, and can lift with ease more than four times its own weight. Bensen points out that rotary-wing gliders were used by German submarines during World War II for observation purposes. Reeled out over the stern of a sub with an observer-pilot at the controls, these engineless craft were employed to search for Allied convoys from beyond the range of the ordinary periscope. Bensen, who is a native of Russia, contends that American youth today is discouraged from learning to fly by strict regulations and high costs of private aviation. In European countries the governments try to encourage glider flying for the training of future pilots. It is entirely possible that the Gyro-glider, which can be built cheaply and operated for only the cost of driving the towing vehicle, may help revive the interest of our youth in aviation. in evidence along with other ultralights.